Vincent Dowling preceded by song, music and the dance of words. Vincent Dowling, Lifetime Associate Director of The National Theatre of Ireland,'The Abbey Theatre,' brings a lifetime of experiences and his one-man show "Wild on Wilde" to this year's edition of Irish Open Mouth. Mr. Dowling will be preceded on the bill by music from Patrick Cummings, Patrick Delamere, Jan and Kate O'Connor Hoekstra, Neil Hickey, Tim Pitt, Pallas and Mike Scott and Edward Todd. Vincent Dowling is a Lifetime Associate Director of The National Theatre of Ireland -'The Abbey Theatre'. He led The Abbey to The Moscow Arts Theatre and brought the famous Russian theatre to Dublin. He organized, directed, and led to great cities and small university towns the first financially and artistically successful Abbey Theatre National Tour of the USA in 55 years. He has played and directed in London, Paris, Florence, and the Edinburgh Festival, and has directed at many of America's finest regional theatres and is also a well-known radio and television broadcaster. Vincent Dowling was Artistic Director of The Great Lakes Shakespeare Festival of Ohio from 1976-84. He performed on three occasions at The White House. In the early 90's, he founded The Miniature Theatre of Chester (MA), a professional theatre now in its 20th Year. 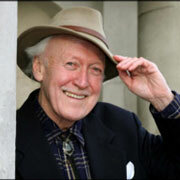 He is a recipient of five Honorary Doctorates and a published writer, poet, and playwright. His autobiography Astride the Moon was published in 2002.